This unit with shelves and plastic bins is designed for optimal storage and classification of all kinds of small products, maximizing the storage space on every shelf. The unit includes Metal Point 2 metal shelving, eleven levels with particle board shelf inserts and between 40 to 120 plastic bins, depending on the size selected. Bins are designed for quick and easy access to their contents, as well as direct visibility of what is stored inside. 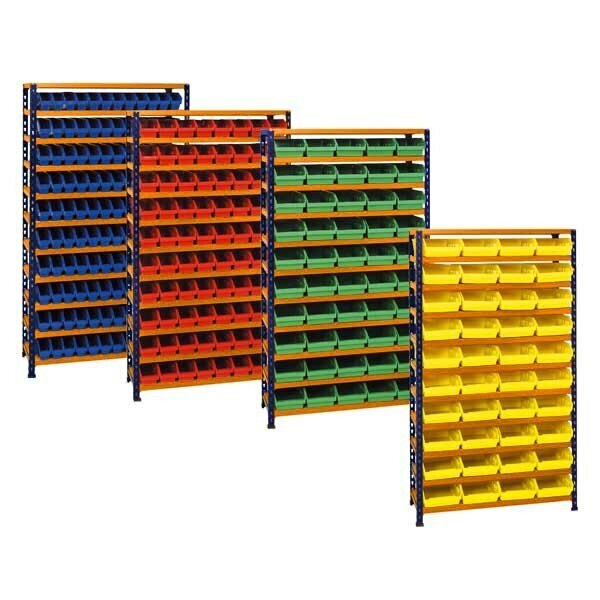 Being manufactured out of high-quality polypropylene, combined with a high load capacity per shelf, means they are strong and durable. An inexpensive small parts storage system keeps parts easily identified. Open hopper front bins, with a label slot, provide fast access to stored items. Heavy-duty metal shelving units with a 750 lb capacity per shelf. Bins are available in red.